Find the most amazing mountain hikes in Asia. There are 839 tours to choose from, that range in length from 3 days up to 40 days. The most popular month for these trips is May. "A very challenging trek, accommodation and food was up to expectations. 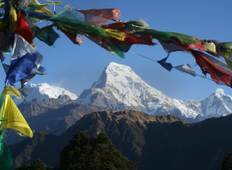 Pricing was..."
"Amazing adventure into the beautiful heart of Nepal, great group size and a tour..."
"Fantastic trip! Couldn't have asked for a better guide/assistant guides! 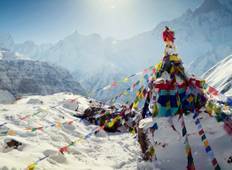 Very supportive..."
"For my vacation, I chose to do the Everest Base Camp Trek and was impressed by Nepal..."
"A truly amazing trek, my first major trek, I wanted to do a truly amazing trek, see..."
"The Experience was great. The accommodation and food and our guide was excellent...."
"If you love Treking and love yoga these are your guys! They showed me more in 12..."
"I had an incredible experience with Pasang Sherpa on my journey Everest BC! Pasang..."
"Very very happy with my Everest base camp trek ! Great communication prior to trek...."
Nepal Trekking Routes Treks & Expedition Pvt. Ltd.
"If you are reading this, you are probably in the same spot I was in when I was looking..."
"Stepping out of the KTM airport had us wide eyed, we'd just learnt that our luggage..."
"Nepal is a varied and interesting country with magnificent landscapes, interesting..."
"It was really amazing TOUR. Even in OFFPEAK times, the tour was everything and more..."
"Dawa could not have been a better guide. His strength and encouragement through such..."
"Excellent experience, amazing locations and knowledgeable guide, very immersive and..."
"Geckos Adventures ran a fault free trekking trip for my husband and I to Everest..."
"Just came back from an amazing and once in a lifetime trek to EBC with NHT! As a..."